Who has the quickest, most word-savvy mind? Word Cup, a new global event for English speakers of all ages, wants to find out! The event celebrates English as the global language that connects and unites us. It tests real-life verbal skill in a fast-paced quiz and rewards personal improvement. All three rounds of the Word Cup—tryouts, qualification round, and finals—take place online. Everyone is invited, regardless of location or physical ability. International Literacy Day, Tuesday, 9/8/2015. Prizes are given in three age categories (14 to 30, 31 to 50, and 51+ years). Future quizzes will also reward those who see the largest improvement from one year to the next. Everyone wins, regardless of skill level! Join Word Cup as a media, prize, or general sponsor! Word Cup is hosted by LearnThat Foundation, a 501(c)3 nonprofit organization. Our web-based study program, LearnThatWord, helps students learn vocabulary through fully individualized practice and a proprietary multi-media dictionary. Proceeds of Word Cup benefit our Vocabulary Junction literacy campaign. Vocabulary Junction helps thousands of childen build the vocabulary they need to become confident readers and writers, and reach their goals. 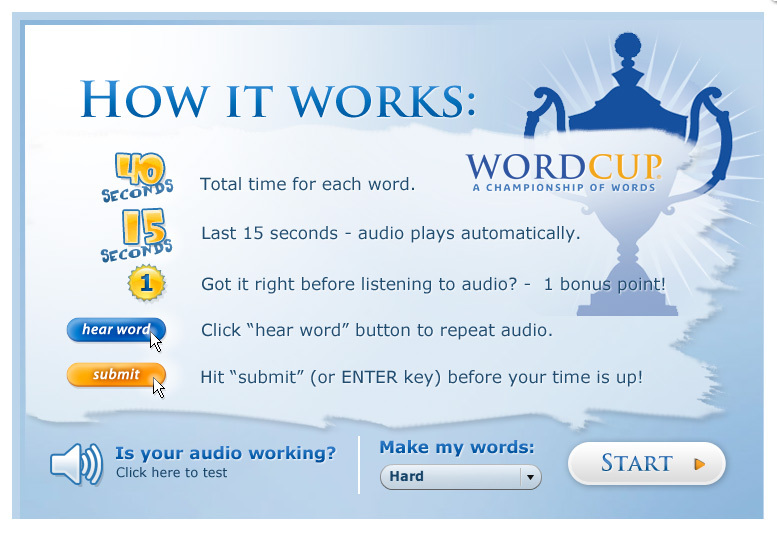 How is Word Cup different from a Spelling Bee? All ages, including adults; native speakers and English learners. Up to age 16 only. Global event in celebration of the English language. Trying out is free. No travel or access limitations. Students need local sponsor and be able to travel. Sponsorship visibility lasts over 3 months, maximizing exposure. Extensive PR: Online, print and broadcast exposure in all English-speaking countries. Interactive Facebook app. Sponsorship recognition only during the event itself. Philanthropic mission. Raises funds and awareness for literacy. No charitable initiative. Everyone is tested on the same list of words for a competition of high academic merit. Random selection of words adds luck to the equation. Rewards personal self-improvement (from one year to the next) alongside excellence. Rewards active vocabulary knowledge and speed in addition to spelling skills.